In the course of preparing the new Greenhouse Development Rights web applications, we had to come up with a set of reference mitigation pathways which represented the choices before humanity, albeit in a simplified and schematic fashion. In this paper — for this post is actually a paper — we present these three pathways — a Strong 2ºC pathway, a Weak 2°C pathway, and a G8 pathway — and their levels of risk, in a fairly precise and technical manner. This paper examines the levels of risk associated with three widely discussed global mitigation pathways: a Strong 2ºC pathway, a Weak 2°C pathway, and a G8 pathway. A very large number of analyses and debates refer to these or quite similar pathways. This paper assesses the three pathways in the light of Working Group I’s recently released contribution to the Intergovernmental Panel on Climate Change Fifth Assessment Report (IPCC 2013), which provided three specific global carbon dioxide (CO2) budgets, and associated them with specific risks of a global surface temperature increase of more than 2°C by the end of this century, relative to the 1850–1900 average. Figure 1 presents the three pathways. Figure 1. 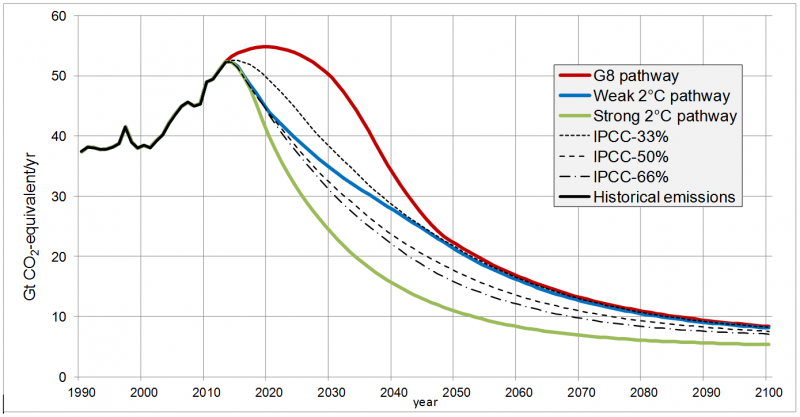 Three politically salient mitigation pathways: G8 (red), Weak 2°C (blue), and Strong 2°C (green). Also shown (dotted lines) are three pathways consistent with the carbon budgets given by the IPCC, consistent with limiting warming to 2°C with 66%, 50%, and 33% probability, given non-CO2 emissions as per RCP2.6. The Strong 2°C pathway is defined to be an extremely ambitious mitigation pathway that can still be defended as being techno-economically achievable (Höhne et. al. 2013). Emissions peak in 2014 and reach an annual peak reduction rate of about 6.1% per year (6.0% for fossil CO2 only). Cumulative carbon dioxide emissions after 2012 are 780 gigatonnes CO2 (Gt CO2), which is well within the IPCC’s budget of 1,010 GtCO2 for maintaining a 66% likelihood of keeping warming below 2°C. The Weak 2°C pathway is fashioned after well-known and often-cited emissions pathways that are typically presented as having a “likely” (greater than 66%, in the IPCC’s terminology) chance of keeping warming below 2°C. Emissions peak in 2014 and reach a maximum annual reduction rate of 3.3% per year (4.4% for fossil CO2 only). Cumulative carbon dioxide emissions from 2012 onward are 1,270 Gt CO2. This exceeds the IPCC’s budget of 1,120 GtCO2 for maintaining a 50% chance of keeping warming below 2°C, suggesting that this pathway carries substantially higher risks than previously believed. The G8 pathway, a marker of the high-level political consensus in developed countries, is based on emissions targets given in an official declaration of the Group of Eight industrialized countries at its 2009 Summit in L’Aquila, Italy (G8 2009). This pathway is not precisely specified in this declaration, but is sufficiently well-defined that we can compare it with the IPCC budgets. Emissions peak in 2020, decline by a maximum of 4.9% per year (6.0% for fossil CO2 only). Its cumulative carbon dioxide budget of 1,610Gt CO2 considerably exceeds the IPCC’s budget of 1,410 GtCO2 for maintaining a 33% chance of keeping warming below 2°C. We thus find that its chance of keeping warming below 2°C is far less than 33%. Table 1. Key data for the three pathways, and the IPCC carbon dioxide budgets against which to compare them. Decision-makers face a choice among future pathways – a choice that will reflect political, economic and ethical considerations as much as science. This paper shows the consequences of choosing a less-ambitious pathway: a marked increase in climate risk. 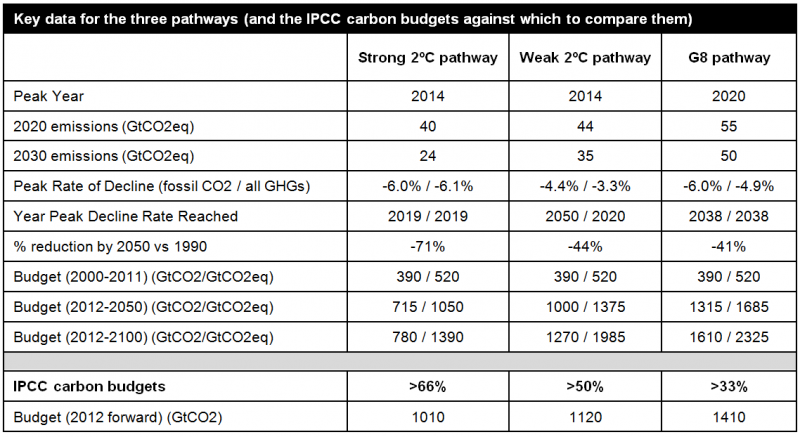 More specifically, according to the IPCC’s budget numbers, it shows that among the three politically salient pathways assessed here only the very ambitious Strong 2°C pathway is likely to hold warming below 2°C. For the rest of this post, click over to the Greenhouse Development Rights website, here. For a “beginner’s guide” to the RCPs, see The Beginner’s Guide to Representative Concentration Pathways, on Skeptical Science. For a detailed discussion of the RCPs, see Van Vuuren, D. P., Edmonds, J., Kainuma, M., Riahi, K., Thomson, A., et al. (2011). “The representative concentration pathways: an overview.” Climatic Change, 109(1-2). 5–31. DOI:10.1007/s10584-011-0148-z. In particular, the 2ºC pathway is based on a Climate Action Tracker pathway developed by Climate Analytics, EcoFys and the Potsdam Institute for Climate Impact Research. For more information, see http://climateactiontracker.org/methodology/18/Global-pathways.html). See also The Emissions Gap Report 2012. United Nations Environment Programme, Nairobi, Kenya. This high maximum rate of decline could be reduced by requiring an earlier peak.